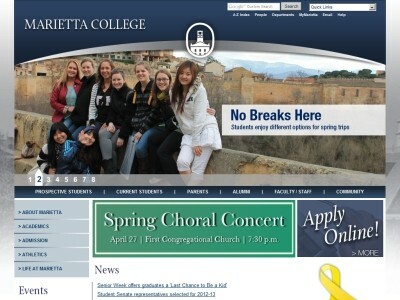 Review: Marietta College is a co-educational private college in Marietta, Ohio, USA, which was the first permanent settlement of the Northwest Territory. The school offers 42 majors along with a large number of minors, all of which are grounded in a strong liberal arts foundation. The school encompasses approximately three city blocks next to downtown Marietta and enrolls 1,417 full-time students. It is known for its petroleum engineering, Athletic Training, McDonough Leadership, and Physician Assistant programs, as well as its highly successful China Program. Historically preceded by the community's Muskingum Academy, established in 1797, today's College was chartered in 1835. In 1860, Marietta became the sixteenth college awarded a chapter of Phi Beta Kappa, the world's oldest honorary society. The athletic department sponsors 18 varsity sports that compete in NCAA Division III and the Ohio Athletic Conference. The college's baseball team won an NCAA Division III record 5th College World Series Championship in school history in 2011. The college sponsors intramural and recreation program, which are housed in the Dyson Baudo Recreation Center. The majority of the students at the college are from Ohio, Pennsylvania and West Virginia, but a sizable portion of the student population is from the New England states, and Asia. 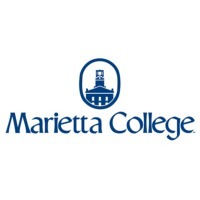 Location & access map for "Marietta College"